The library and the study room of the American Center contains about 1500 books; numerous American periodicals , popular as well as scholarly publications; daily newspaper USA Today ; DVD collection with documentary and feature films, and on-line databases. 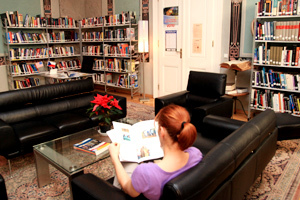 The catalogue of the library is available online . DVD collection contains about 200 films, documentaries as well as feature films. All videos can be viewed on our American Center video stations in the study room during opening hours (Monday - Thursday 1-4pm, on Tuesdays till 7pm). The complete list of documentaries can be seen here . School groups have the opportunity to watch films from the collection outside opening hours (you can find more information about Speakers Bureau's program here ). ProQuest is an electronic publisher and microfilm publisher. It provides archives of sources such as newspapers, periodicals, dissertations, and aggregated databases of many types from 1986. American Center also provides access to information that Americans find at their public libraries in eLibraryUSA , which offers a broad range of resources about learning English, American history and culture, health, business, and more.